Petra is one of the most famous and beautiful archaeological sites in the world. 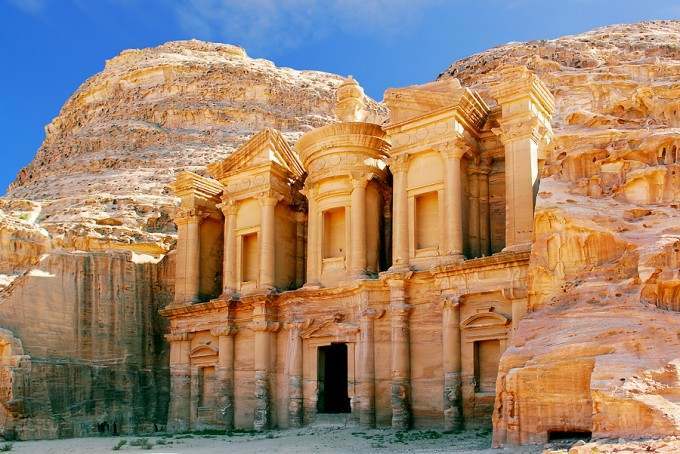 Named for the Greek word for “rock”, Petra is located in the Middle Eastern country of Jordan, about three hours south of the capital city of Amman. Archaeological evidence indicates the area around Petra has been occupied since prehistoric times. The ancient city of Petra was built over 2,000 years ago by a group of semi-nomadic people of Arabic descent called the Nabataeans. What is so unique and stunning about Petra is the city was carved out of the rose-colored sandstone cliffs of a deep gorge called the Siq, or “the shaft”. This incredible historical and cultural site was voted one of the New Seven Wonders of the World in 2007. The buildings cut into the steep cliff face have doors which lead into rock cut chambers behind the ornate facades. The most impressive of these buildings is called Al Khazneh, or the Treasury. The Treasury is nearly 12 stories tall and is so named because the Bedouins told tales that it once contained vast amounts of treasure. It is actually a royal tomb or temple, like many of the other rock cut buildings at Petra. In the tombs there is archaeological evidence that the Nabataeans practiced the funeral rite of feasting with the dead. Family members would eat a meal in the tomb and leave some food for the soul of the deceased. This practice was a way to connect the living and the dead, and was practiced in various forms since Neolithic times. Besides the rock cut buildings, there were also free standing buildings built at Petra. Houses were free standing but they have since all been destroyed by earthquakes. The Nabataeans engineered a complex system of channels and cisterns to collect rainwater for drinking. It is a credit to Nabataean engineering that this ancient water system is still used today by the Bedouins. Even in the arid climate the Nabataeans farmed the land and raised sheep, goats, camels and horses. The Nabataean kingdom prospered by controlling the caravan trade routes that linked the East to the Mediterranean. These caravans provided spices, textiles, frankincense and myrrh to the Greek and Roman world. Trading frankincense and myrrh was a very lucrative business in the ancient world. Both were used to make incense which was burned in every temple as an offering to the gods. The Nabataean kingdom remained prosperous and powerful until 106 A.D. when it was finally conquered by the Roman Emperor Trajan. The city was devastated by severe earthquakes in 336 and 551. Petra was largely abandoned by 700, except for a fort build by Crusaders in the 12th century. Petra was sometimes called the “The Lost City” when it was rediscovered in 1812 by Swiss explorer Johann Ludwig Burckhardt. Petra is Jordan’s most popular tourist destination. It is a must see for anyone interested in history or archaeology. Photography enthusiasts will not be disappointed when the sunlight brings out the natural highlights in the rose-colored rocks. Early morning or late afternoon is the best time to take photographs in the gorge. Tourists should plan on one day to see the main sites or several if they would like to see all areas of the Petra Archaeological Park. There are self-guided hiking trails appropriate for any ability level, as well as difficult hikes which require a licensed guide. Unfortunately excessive tourism has played a part in the deterioration of this magnificent ancient city. Tourists are asked to avoid purchasing relics of any kind and to walk carefully in the vicinity of the buildings. To protect the site, Petra was designated a UNESCO World Heritage Site in 1985. The World Monument Fund has taken part in numerous preservation and conservation projects over the past ten years. Petra is constantly threatened by earthquakes and flash floods, and erosion is slowly wearing away the delicate facades. It may be hard to truly appreciate the incredible architectural achievements at Petra without seeing them first hand. The ancient city of Petra is truly one of the New Seven Wonders of the World. The “rose-red city” will surpass all expectations and fill you with wonder and awe.